Normally boisterous crows and blue jays held their tongue; the cardinals and sparrows offered no songs of joy. An eerie, yet peaceful silence marked the new day. But the serenity did little to quell the buzzing mosquitoes and persistent deer flies. The shirt’s sleeves hung long and open. As I rambled, the cuffs swung to and fro, shooing the pesky demons away, to some degree. White hair hung free about the shirt’s collar in hopes of protecting my neck. 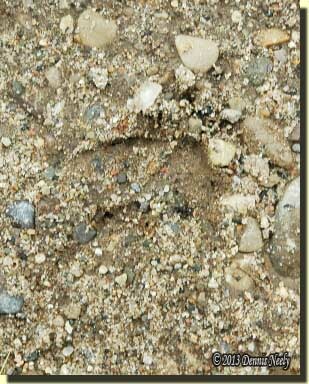 A young doe’s faint track in a sandy spot told of its passing. From the looks, the deer crossed the trail an couple hours before, cloaked in night’s abyss. Curiosity pushed me to unravel the whitetail’s course as it wove amongst the sand and dew-tipped blades of green grass. The creature stepped to the left, then the right, then back to the left. The doe seemed concerned with the trail, now overgrown with thick-leaved autumn olive branches that curved earthward. The tracks zigzagged twice more, then headed straight over the hill to the ridge’s west face. I did not follow. My elk moccasins attempted to hug the left wagon rut, but the underbrush forced me to change from depression to depression as I walked. Despite my best effort, water splattered my sleeves and pelted the backs of bare hands. Sprinkles tickled my upper thighs and spotted my buckskin leggins. I contemplated covering the trade gun’s lock as I would in a rain storm, but chose to tuck it deep in my right arm pit. The wagon trail disappeared at the little bend I depend on as a guide to favored lairs farther down the ridge’s slopes, both east and west. I stood still and looked about. A red-tailed hawk drifted overhead. A crimson cardinal flitted into the shadowy safety of the cedars. But my gaze kept returning to those two ruts, gobbled up by summer’s growth. The narrow ruts might never heal. A few feet to the east, a wide depression meanders along the ridge crest. My father said as a youngster he was told it was an Indian trail, a part of the Great Sauk Trail system. If that is true, man’s presence is evident, despite Mother Nature’s best effort. Hefty cedar trees grow in the supposed Indian trail, but the depression can still be seen and followed, over time’s threshold and back to the edge of 21st-century civilization. As I stood there, I marveled at the choking growth that occurred over such a short period of time. The scene reaffirmed what I already knew: wilderness roads need constant clearing. True, from my alter ego’s perspective, the urgency to clear away the dense foliage existed in the far off future—over two centuries distant. The land management plan for the North-Forty includes the periodic maintenance of the property’s two track road, but it does not indicate within which century the work must take place. 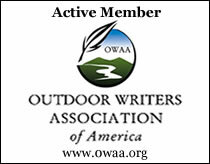 In an 18th-century context, a lone woodsman and his occasional companions do not require a road through the wilderness. Animal trails suffice. With the River Raisin close at hand, the canoe, bateau or pirogue provide a connection to the eastern settlements, like Frenchtown. And where rivers did not flow, the horse provided easy access. As I stood there, I realized how quickly the path grew full from neglect, and at the same time I realized how quickly the settlers poured in, as well. In those later years, one or two pack horses eased the journey west, especially for those hearty individuals, like Horace Blackman, enamored with establishing a frontier homestead in the newly surveyed wilderness. But the road stopped at the little village of Ann Arbor. There are two basic types of vegetation along my wagon road to yesteryear: slow growing cedar trees interspersed with a few hardwood saplings and the fast growing autumn olive, an invasive species native to Asia, unknown to the Old Northwest Territory of 1795. Some consider the aromatic red cedar an invasive species, too, because it was native to the Northeastern United States and spread west in the latter decades of the 19th century. I find no mention of the species in the early surveyors’ notes, or journals of this region, but the cedar trees dot my 18th-century Eden and find their way into many of my scribbled entries. The autumn olive is aggressive and demands more modern methods of control that have little value for the living historian. But the cedars and hardwood saplings present a tremendous learning opportunity for the traditional woodsman—a chance to learn road blazing skills firsthand. 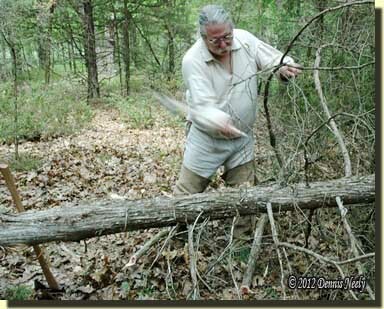 I began maintaining the wagon road in a period-correct manner about two years ago with a tomahawk and felling ax. The progress is slow, but faster than the cedars’ growth rate. Like all exercises in the wilderness classroom, the first lessons were difficult. A sharp tomahawk or ax is a must, and the proper technique requires developing a keen sense of hand-eye coordination. Controlling the ax’s bit is imperative, as is learning when to strike a limb, branch or trunk at an angle or straight on. And there is a method to notching a tree for felling as well as cutting the trunk into usable logs. From the traditional hunter’s perspective, maintaining a wagon road by hand fosters additional insight into the frontier ways of our beloved hunter heroes. At the very least it offers period-correct campfire stories, like the time a falling tree’s crown hung up on a neighboring oak’s lower branch. To be sure, the tale is not as harrowing as Jonathan Alder’s about the bear hunt and his perilous fall from a broken poplar tree (Alder, 75-76). The details are a bit more hilarious, set in the mid-1790s, and for now, best left for another time. This entry was posted in Living History, Skills and tagged Dennis Neely, historical trekking, North West trade gun, Northwest trade gun, trade gun, traditional black powder, traditional black powder hunting, traditional blackpowder, traditional blackpowder hunting. Bookmark the permalink.